This composite image of rover imagery and computer graphics depicts Spirit's trip over Husband Hill. The rover model was created by Dan Maas and the synthetic image by Koji Kuramura, Zareh Gorjian, Mike Stetson and Eric M. De Jong. Even on Mars, misery may love company. On Monday, NASA declared the Phoenix Lander sitting in Mars' arctic plains as a rest-in-peace goner. Dust storm activity and the seasonal decline in sunshine at the robot's landing site meant that the craft's solar arrays couldn't churn up enough energizing power – and expected outcome after five months of exploration. But now the word is that the Spirit Mars rover may be facing near-death. Resting in its equatorial exploration zone on the red planet, Spirit is in silent mode. 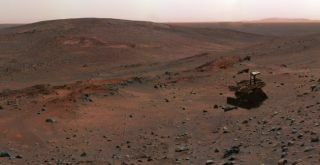 "It's hard to say exactly how bad this is," said Steve Squyres, leader of the Mars Exploration Rover twins – Spirit and Opportunity. "We've got a rover with dirty solar panels that took a direct hit from a major regional dust storm, so that's serious business. But we don't know enough right now to say how serious," Squyres told me. Ground controllers have sent commands to Spirit telling it to conserve power and not talk back to Earth until tomorrow. So not hearing from Mars machinery right now is hardly a surprise. "Of course, we could also not be hearing from it because the power situation has gotten bad enough that it can't communicate," Squyres added. "At this point, we simply have no way of knowing." So the planetary prognosis for Spirit: "We have to wait patiently, trust the vehicle's ability to keep itself safe…and hope for the best," Squyres advised. As for the Opportunity Mars rover, "things are looking great," Squyres noted. That robot is in some very difficult terrain at the moment, but still routinely driving some 260 feet (80 meters) or more per Mars day. "For the time being life is good at Meridiani Planum," Squyres said. Leonard David has been reporting on the space industry for more than four decades. He is past editor-in-chief of the National Space Society's Ad Astra and Space World magazines and has written for SPACE.com since 1999.